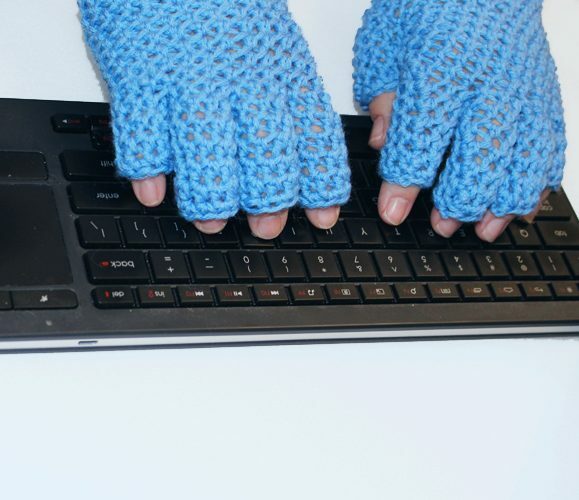 Keep fingers warm & fingertips free! Make your EasyFit FingerTip Gloves. Ready for every one, every day! Use either Sport or DK weight yarns to achieve a fine (red) or thicker (blue) glove. Variegated or solid color yarns will produce different visual effects. The EasyFit Fingered Gloves Crochet Pattern has been tested by independent crocheters (some of their photos are in the gallery). The Crochet Pattern for the EasyFit FingerTip Gloves is available in both standard American or UK/AU terms with step-by-step instructions and photos to help guide your hook to completion. Approx 170m of 4ply/Sport weight yarn OR 15m of 8ply/DK yarn– whatever colour(s) and style you like.